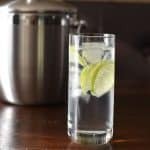 This twist on the classic Gin Tonic recipe, reduces the carbs with a simple hack. Read on how to enjoy this light and refreshing drink without feeling guilty. Use a standard jigger to add the gin, tonic and soda. I keep my gin in the freezer, so that its absolutely chilled and also use chilled tonic and soda. Twist and add a lemon peel or a full lemon slice to the glass. You can alternatively put a few drops of lemon juice. Stir gently and sip away!